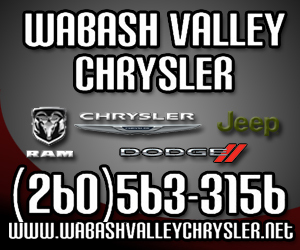 Micah Johnson, the Chicago White Sox’s rookie second baseman, has ties to Wabash County. Johnson’s mother, Tanya (Airgood) Johnson, is a Manchester High School graduate. She attended Manchester College where she met Johnson’s father, Harold Johnson. His grandmother, Peggy Boggs, and grandfather, Tom Airgood, still live in North Manchester. A Wabash woman is the proud owner of a new, 42-inch flat-screen television. 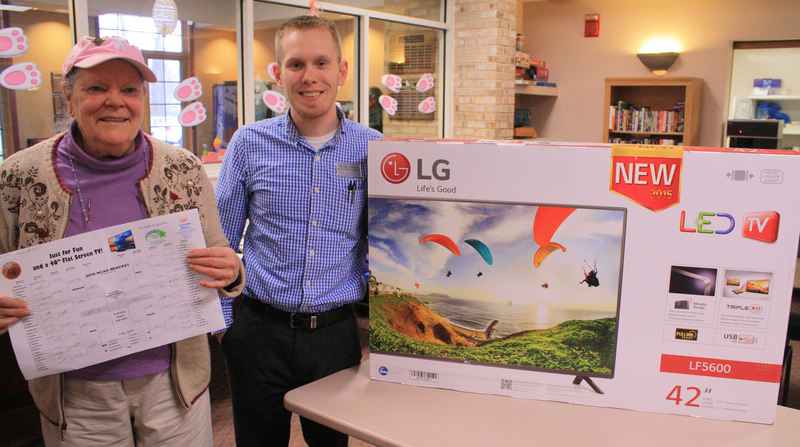 The woman, Sue Clapp, won the television in a contest conducted at the Dallas L. Winchester Senior Center and sponsored by Autumn Ridge Rehabilitation Center. Clapp and one other participant picked Duke to win the NCAA Men’s Basketball Tournament. Because two had picked Duke, the contest came down to a tie-breaker, and Clapp’s prediction of a 52-48 final score was closest to the final score, 68-63. Like millions of other people, I watch my share of sports on TV. 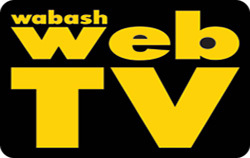 As a person who has experience in sports casting on radio as well as WebTV, there are several things that really get under my skin that the networks ask their announcers to do. Ask my wife, she hears my rants at least once a week. I have been trying very hard to hold my tongue on this, but after watching the Final Four broadcasts, it put me over the edge. Now, before I rant on, please understand that a number of these points are contractual with the networks, so coaches and managers are obligated to do these things. CBS pays the NCAA millions of dollars a year to broadcast the Final Four. ESPN, FOX, and NBC do the same thing on various sports including the World Series, NCAA Football , the NBA, the NFL including the playoffs and the Super Bowl. Anybody who knows me knows that I am a baseball nut. Several years ago when Baskins-Robbins had as one of their 33 flavors, “Baseball Nut;” my daughter thought it was named for me. The ice cream concoction was vanilla ice cream laced with raspberry swirl with cashews. I liked it, but not as much as the game itself……and I’m still waiting on my royalties from Baskin-Robbins. As the dawn of a new baseball season unfolds, I am ready. The final game of the World Series in the fall is bittersweet for me. It celebrates the culmination of a great postseason. But it also means there is no more baseball until spring. I count down the days until spring training starting about Nov. 1. I follow the hot stove league, which is the activity of all of the teams in making trades and signing free agents all winter long. But I live for the beginning of April. NORTH MANCHESTER -- Manchester senior Lucas Schilling signed his letter of intent to play football at DePauw University next year. 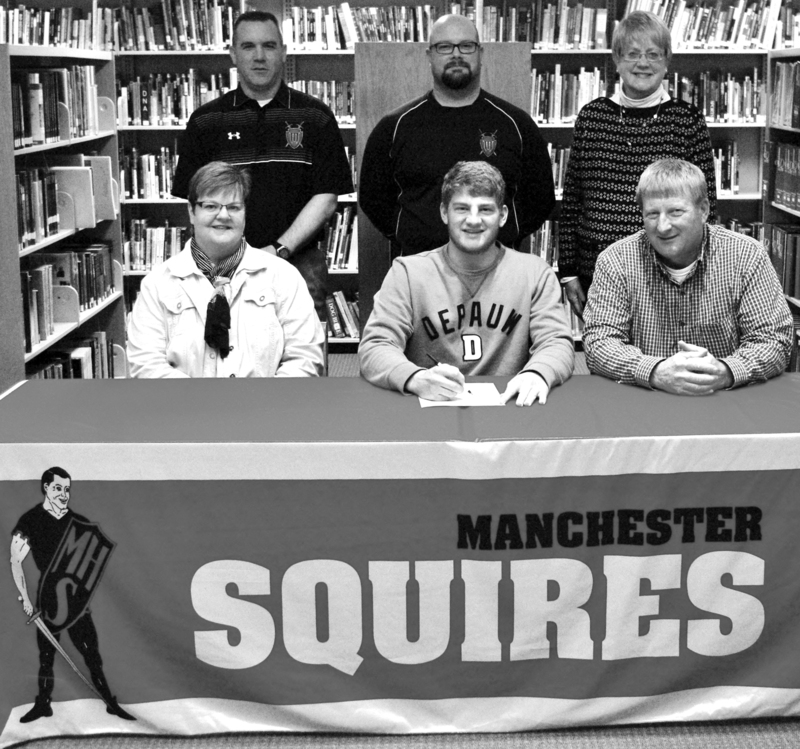 Schilling was the quarterback for the Squires this past season. NORTH MANCHESTER -- Manchester senior Branden Scott signed his letter of intent to play baseball at Midland University in Fremont, Neb., next year. 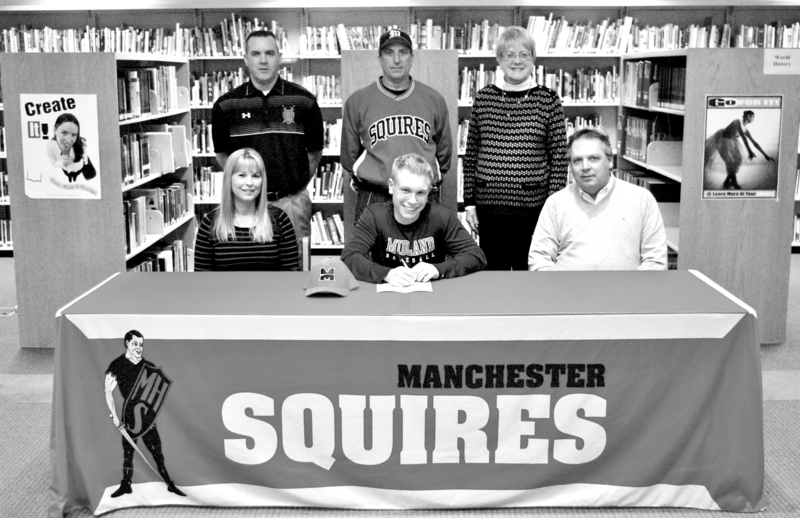 Scott is the Squires second baseman and will play the same position in college. 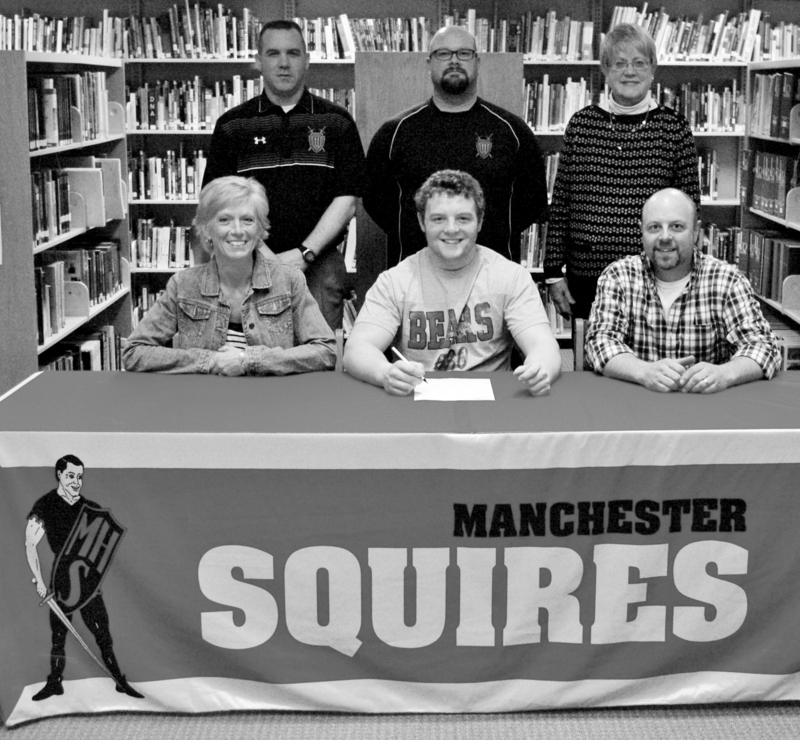 NORTH MANCHESTER -- Manchester senior Thad Miller signed his letter of intent Tuesday to play football at Franklin College next year. Miller was the heart of the linebacker core for the Squires this past season. The Southwood baseball team opened its season Tuesday, March 31, hosting Northwestern, falling to the Tigers 5-2. The game was scoreless after two innings with the lone hit being a double from Brandin Frazier before things changed in the third. Knight pitcher Brennan Kelly walked the first batter before promptly picking him off. After striking out the second batter the Knights would give up a runner on an error before a walk and a two out, two-run double gave Northwestern a 2-0 lead. After the third walk of the inning the Tigers would use the long ball to grab a 5-0 lead heading to the bottom of the inning.